Police action follows complaint by BJP’s Tamil Nadu chief who was on the same flight. Lois Sophia, a 28-year old research student, had never thought that she would land in a jail when she tweeted and asked what will happen if she shouted slogans against the “fascist BJP government”. 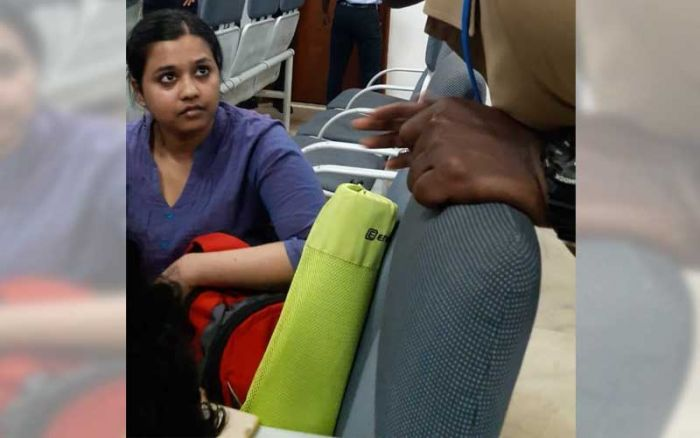 The research student in her tweet had said that she was on the same flight as the BJP Tamil Nadu chief and really wanted to shout slogans against the “fascist BJP government”. “Will I be kicked off the flight?” she had asked. Hours later, Sophia was arrested and charged with causing public nuisance under section 290 of the IPC and for causing breach of public peace under section 75(1) (C) of the Tamil Nadu City Police Act, 1888. As per the reports, Sophia has been remanded for 15 days judicial custody and was later granted bail by a Thoothukudi court. As per reports, Sophia, who has extensively written on the recent protests and police firing on workers at the Sterlite Thoothukudi plant, had shouted “Fascist BJP government down, down” at the airport in Tuticorin in front of BJP Tamil Nadu chief, Tamilisai Soundararajan, while both of them were waiting to collect their luggage after travelling in the same flight. Fuming in anger, Soundararajan asked Sophia, “Is this freedom of expression?” While the BJP chief was questioning Sophia at Thoothukudi airport, the police was seen pacifying her. “She is smart, she knew what she was doing,” the BJP chief told the police. Alleging that Sophia shouted anti-BJP slogans, the BJP chief also claimed that her “life was in danger.” “A middle-aged lady on seeing me started raising anti-BJP slogans and even followed me till the arrival gate. Her appearance looked threatening, I feel some organisation is behind her,” Soundararajan was quoted as saying by News18. However, Sophia’s father has come out in her support and has narrated a different sequence of events. According to him, his daughter had moved away after raising one slogan. He has also lodged a complaint against the BJP Tamil Nadu Chief for threatening his daughter. “As soon as the flight landed, Tamilisai along with her supporters rounded us up. The BJP cadre were abusing us and threatened us,” News18 quoted Sophia’s father as saying. “For more than 8 hours, police kept my daughter in station for inquiry. She didn't use any derogatory remarks about Tamilisai or anyone. She just said, "Fascist BJP Down down", which is purely freedom of expression. Now, I have lodged complaint against Tamilisai and others for threatening us. So far, no action has been taken,” he added. Later, welcoming the bail granted to Sophia, Stalin urged the Tamil Nadu government on Tuesday to withdraw the case filed against her. Stalin said in a statement that the AIADMK government should not only withdraw the case filed against Sophia but also take action against the BJP members who had threatened her family based on the complaint filed by her father. Stalin said that in a democracy every individual had a right to criticise the government (with inputs from IANS). Out of the 39 seats of Tamil Nadu, 38 seats are conducting the election in the second phase.